Practically Invisible In-Ceiling & In-Wall Loudspeakers. The new Vanishing Series speakers do just as their name implies: they almost completely disappear, leaving only you and the high performance audio you want, and never interfering with your room design. Use the Vanishing Series loudspeakers to complete a system of traditional loudspeakers (by adding inconspicuous surround channels). Use them all around to design a complete, practically invisible sound system. Use Vanishing loudspeakers to unobtrusively bring music to every room or area of your house. And because we know that all rooms are different, we’ve included superior audiophile sound customization features so you can easily optimize your Vanishing Series speakers to any installation location. Not only can you aim Vanishing Series tweeters to insure superior off-axis imaging, but you can use the reflective room (tweeter) compensation switch to compensate for reflective rooms, and the wall distance setting toggle to optimize for placement close to walls or corners. Installing virtually-flush in-ceiling & in-wall speakers has never been easier, whether you’re a pro or a confident DIY-er. In existing walls, take advantage of one-cut drop-in installation and the security of our rotating cam stabilizing system. Our precision-engineered design lets you get professional results with no drywall repair. High Performance Tweeters Superior imaging and clear, lifelike detail is revealed by superior tweeter technology. 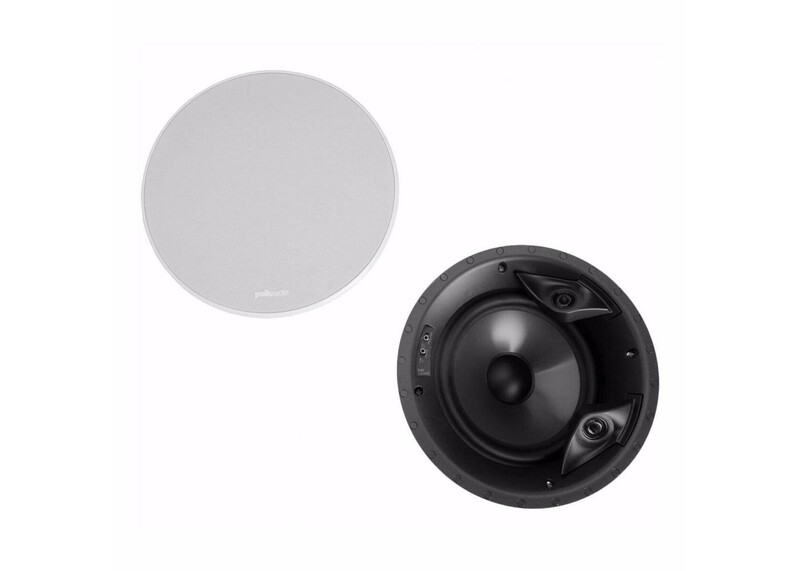 Vanishing Series tweeters feature 15° swivel housings, for more direct high frequency control, excellent off-axis imaging and more placement flexibility. The reflective room (tweeter) compensation switch (see individual model specs) can digitally compensate for reflective rooms without hindering high performance. Patented PowerPort Bass Venting Speakers built into your walls can struggle to reproduce detailed deep bass because they lack enclosures tuned to support those frequencies. Vanishing Series speakers feature our patented PowerPort bass venting system to alleviate “chuffing” resonances, and roll out deep, musical bass that blends smoothly, for more efficient high performance bass than ever before. Exclusive Audio Customization Controls Easily accessible controls allow you to make advanced audio tweaks to optimize your sound for any installation. Use the reflective room (tweeter) compensation switch to digitally compensate for harsh reflective surfaces. It doesn’t merely reduce high frequencies; it actually allows you to “notch out” a specific area of the spectrum (3500-6000Hz) where room acoustics most often interfere with performance. The wall distance setting toggle allows for maximum placement flexibility with no loss of performance by tailoring the frequency response to compensate for proximity to corners or adjacent walls. This sophisticated technology also allows you to restrict specific midbass frequencies (80-150Hz) that can produce “boominess” in close quarters, while leaving deep musical bass response intact. F/X® surround speaker models feature an additional imaging toggle, giving you more placement flexibility behind or to the sides of your listening position. Never sacrifice professional audiophile features and performance when you can have it all, even on a budget. Award-winning technologies and high quality materials come together with purpose-designed engineering in the Vanishing F/X-LS line of "invisible" in-ceiling surround-channel speakers. Customized audio controls give you more placement flexibility for optimum surround effects, and maximum interior design wow-factor. Use the space previously taken by speakers to add seating or wall treatments! Use the customized imaging toggle to easily optimize surround effects in any room setup; choose the "Solid" setting for more localized effects, and the "Diffuse" setting for greater rear channel ambience. Dual offset ring radiator tweeters extend top-end response for incredible details and realistic imaging.